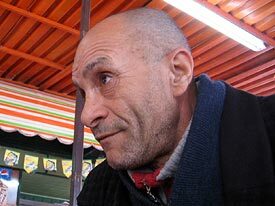 Redwan Abushwesha, painter and writer, Tripolis. We met the writer and artist Redwan Abushwesha in a bustling Tripolis street and sat down in a garden where we had tea under a shady roof. Abushwesha was talking nonstop because he had to say so many things, and he jumped from one subject to another – not a sign of longwindedness, but of his unbelievable wide global outlook. Abushwesha is at home in international circles – in London where his daughter is a filmmaker, and in Dublin (he speaks English fluently) as well as in his homeland, Libya. 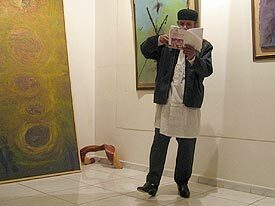 And as a Libyan he’s as familiar with the culture of his country as with world culture. Maybe it was a hint of irony that he offered us a lecture on Musil’s “The Man without Qualities” against a fee of 150 Swiss francs. For him, the history of Libya doesn’t begin with Islam – not even with the Roman culture on the Mediterranean coast. It rather goes back to the hunter and herd cultures of 10 000 years ago in the Sahara. He’s very familiar with the rock drawings in the desert, and he proudly sees them to be part of the history and cultural heritage of his country. When a Libyan woman once remarked that these archaic artistic testimonies had nothing to do with Libyan art, Abushwesha retorted that “the world’s borders do not end at the village’s borders”. With “The King of the Dead and Other Libyan Tales”, short stories by Abushwesha have been made available: not very extensive, but intense as to their expressiveness. One could think of edifying stories printed on the pages of a calendar: minor occurrences stepping up into the ranks of universal occurrences. In his tale “The Valley Blooms in September” he makes a connection between his deeply being linked to his Libyan homeland with the fact that many Libyans have spent some time abroad. What’s not told in the story but is part of it, is the fact that, in this way, people in Libya have accumulated knowledge on the world which is remarkable.